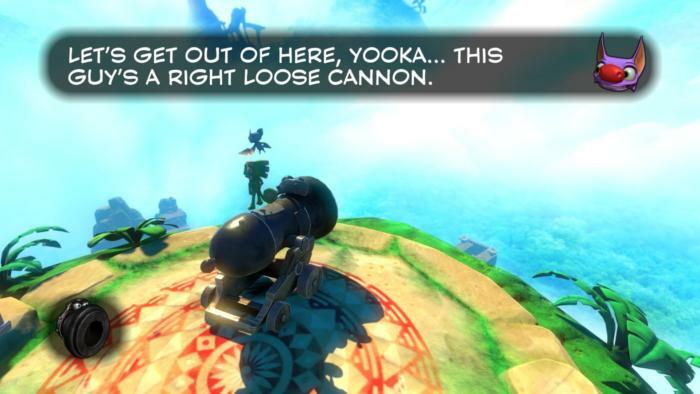 Playtonic's Kickstarter promised a spiritual successor to Banjo-Kazooie and that's what Yooka-Laylee delivers, flaws and all. 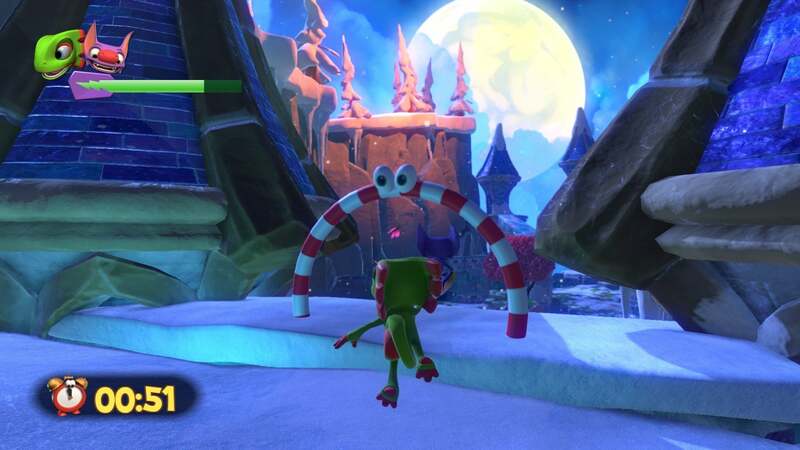 To call Yooka-Laylee a Banjo-Kazooie “clone” is to do it a disservice. In everything but name, this is a full-fledged Banjo-Kazooie sequel—closer, in fact, to its Nintendo 64 predecessors than actual 2008 sequel Banjo-Kazooie: Nuts & Bolts. 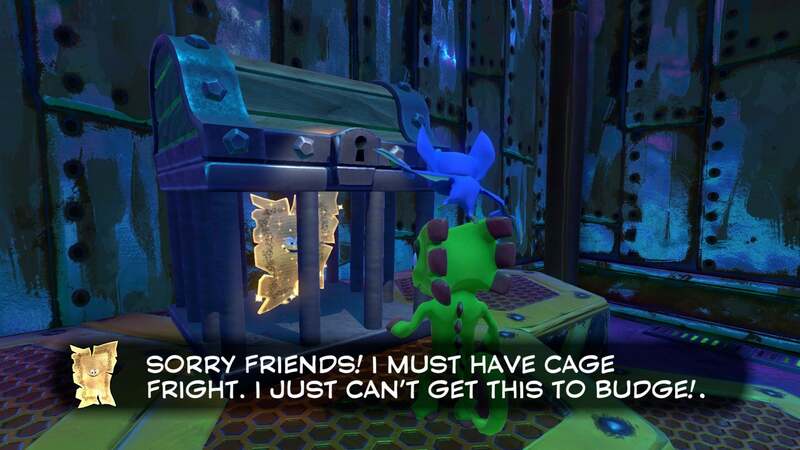 And that’s exactly what Playtonic’s Kickstarter promised, so good on them. You play as Yooka and Laylee, a chameleon and bat respectively. The pair are lounging around their home in Shipwreck Creek one day when evil Capital B (a play on both his bumblebee-like nature and his status as “Boss”) decides to vacuum up all the books in the world and, I guess, turn them into gold or something. The struggle between “Art” and “Capitalism” is obvious, though the actual plot not so much. Like any good N64-era platformer these comic-book-villain ends are more set-dressing than deep social commentary, an excuse to get our heroes on their way. Is it a not-so-subtle jab at Microsoft and other big publishers for putting profits ahead of the “art” of making games? Maybe. But if you’re coming to Yooka-Laylee for that sort of moralizing I think you’ve walked into the wrong review by accident. Yooka and Laylee certainly aren’t there to fall into deep philosophical discussions about ethical consumption under capitalism. They’re mad because Laylee was using a book as a coaster for her drink, and then the book was sucked away. That’s it. Turns out Laylee’s coaster was a special book though, full of “Pagies”—golden pages that, when collected, allow the duo to enter special “Grand Tome” books and access other worlds. There’s the island-themed Tribalstack Tropics, icy Glitterglaze Glacier, Halloween-skinned Moody Marsh, and more. And, again like its N64 predecessors, your job is to collect various MacGuffins across these worlds, either picking them up off the ground or solving some simple puzzles. There are 145 Pagies total and 1,010 Quills. 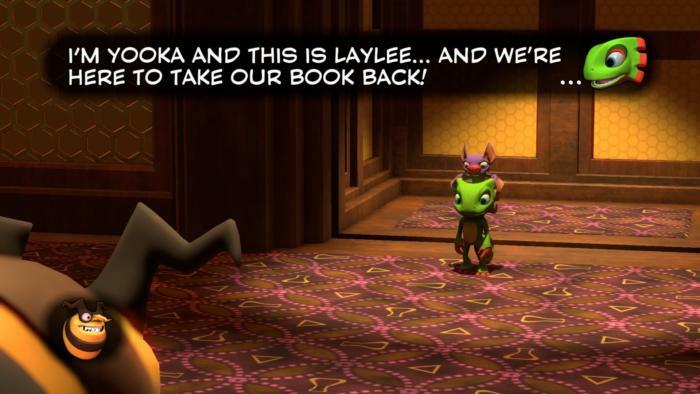 The former are used to unlock new Grand Tomes to explore, the latter to buy new moves for Yooka and Laylee—and (later) to collect compulsively, because that’s what you do in these games. Sound similar to Banjo-Kazooie? It should. The conceits are essentially the same, though given a new name and theme. Jigsaw pieces are now pages, music notes became quills, honeycomb pieces are butterflies, and so on. For every Banjo-Kazooie concept, there’s a parallel in Yooka-Laylee. As I said, it’s a sequel in everything but name. 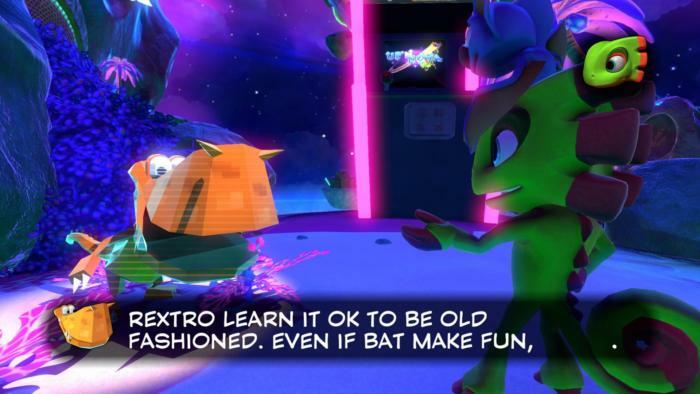 Yooka-Laylee even has a clever way of recalling the N64 era, intentionally or not. There are five Grand Tomes to explore, plus the hub. Saying “five worlds” is a bit of an understatement, though. The first time you enter any Grand Tome it’s essentially the size of an N64 level, a small and centralized hub with a few puzzles to solve, maybe a handful of Pagies, and a couple of characters to interact with. Finish up though, collect everything you can find, and you’ll notice you’re still missing most of the Pagies and Quills from that world. You’ll have to go back to the hub, at which point the game prompts you to expand the Grand Tome—basically add more Pagies to the book. There are also Donkey Kong Country-style mine cart sections, Mario Party-type mini-games housed in old arcade cabinets, footraces, flying sections, elemental puzzles—all the stuff you’d expect, and each with the goal of scoring another Pagie and unlocking another Grand Tome in which to do that same stuff all over again. And so I guess the question is: Did you miss this type of game? The phrase, “fans of the genre will love it,” has become a punch line in game reviews. It’s trite, silly, practically useless. But with Yooka-Laylee? It’s perhaps the best description I can imagine. 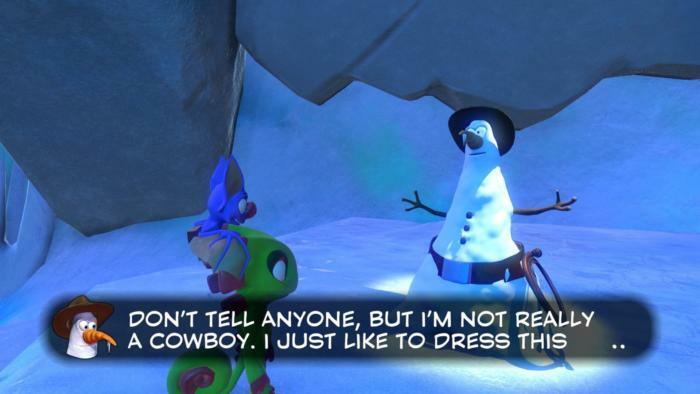 Fans of the genre will love Yooka-Laylee, because it’s tailor-made for them to love it. Never before has a game banked so hard on nostalgia above all other aspects. I mean, it has to. The writing is full of dad jokes and bad puns, the plot as complex as a G.I. Joe PSA, the core mechanic running around and collecting items (many of which don’t have any use except bragging rights), the boss fights annoying and overly-long, the platforming easy and straightforward—the same as the N64 games it aims to emulate. Lose any of those aspects, and you lose the spirit of it entirely. Does this style of dead-simple 3D platformer have an audience, outside of those who look back on the N64 with nostalgia? Maybe not, to wit: It’s worth looking at why the genre became popular to begin with, especially if you didn’t live through that era or if you came to video games later on. Because as much as my mother argues she can’t figure out how to use dual analog sticks—valid—it’s worth remembering that at one point none of us knew how to use dual analog sticks, or even the N64’s single analog stick. 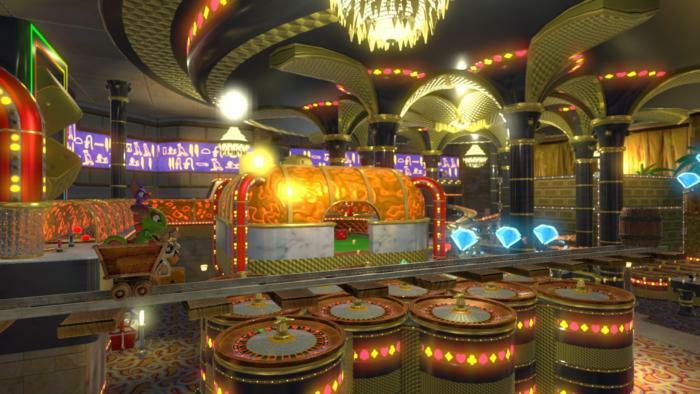 Part of Mario 64’s charm at the time, of Banjo-Kazooie and Crash Bandicoot and Gex and all the other knockoff platformers of that era, arose from merely exploring a three-dimensional space. It’s funny to think about now, but that was often a challenge in itself. Have you played Mario 64 lately, though? Maybe (and pardon the legal implications here) using an emulator and an Xbox controller? It’s still a well-designed game, but stunningly simple aside from some awkward camera angles and a few obnoxious control quirks. We’ve learned to navigate our virtual playgrounds with a grace and fluidity we lacked in 1996, and built ever-more-complex scenarios within them. After all, what separates an Uncharted or modern Tomb Raider game from those ‘90s platformers except a grittier tone, higher production values, and a hefty amount of shooty bits? You can’t put the platforming genie back in its jiggy-shaped bottle, in other words. In an era of Assassin’s Creeds it’s hard to make a ‘90s-style platformer with any real challenge, at least without compromising that ‘90s feel. And so maybe it’s smart Yooka-Laylee doesn’t try to do so, remaining dead simple and relying more on nostalgia to carry the burden, on Day-Glo colors and groan-worthy jokes and that feeling of finally uncovering the last Quill or Pagie in a level. It limits the audience, but for a certain subset it slips on like a comfy 20-year-old sweater of memories once lost and now recovered. As a longtime Banjo-Kazooie fan myself, Yooka-Laylee is exactly what I’ve missed. Does the 3D platformer needs an industry-wide revival? No. But if I got another Yooka-Laylee every two or three years? Yeah, I think there’s room for that—for a celebration of a bygone era, a simpler time full of simpler games with simpler aims. I’d like to see Yooka-Laylee 2 or Two-ka-Laylee or whatever they call it take more risks—elevate the genre rather than emulate. Yooka-Laylee’s final Grand Tome is a psychedelic tour de force and easily the strongest of the five on offer here, and I’d love to see other, more creative worlds in the sequel instead of another “Beach/Snow/Marsh” retread. But Playtonic promised a spiritual successor to Banjo-Kazooie, and that’s what we got. It might not suit everyone’s needs, but it suits mine and likely suits the needs of those who’d want a Banjo-Kazooie successor in the first place. That’s an important caveat—but then, that’s why reviews are a subjective process. Everyone has bias, even if that bias goes back 20 years, to sitting on a friend’s couch munching on pretzels and guiding a silly bear and his backpack-bird around a tropical island. 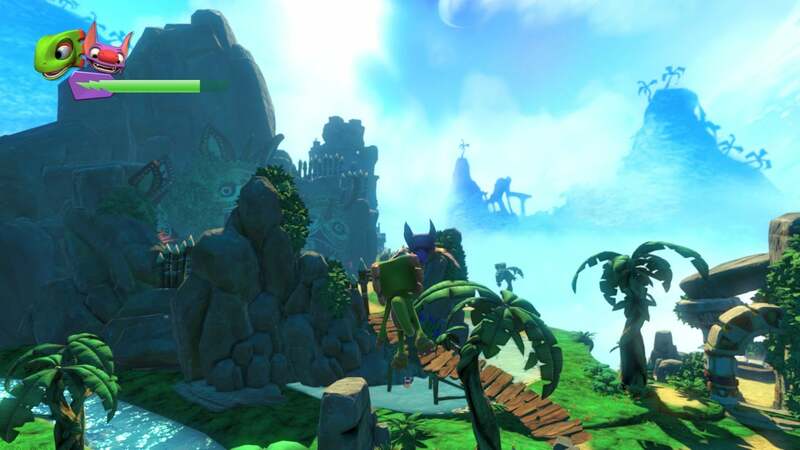 Playtonic promised a spiritual successor to Banjo-Kazooie, and that's what Yooka-Laylee delivers, flaws and all. It's a loving throwback to a bygone era and style of gaming. Did I mention "warts and all"? Not everything here has aged well.